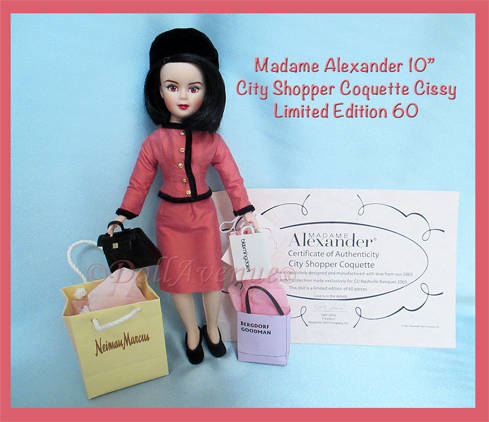 Rare 10" Coquette Cissy, "NY NY City Shopper," exclusively made for the 2005 CU Nashville Banquet. Jacki style Coquette has classic black shoulder length hair with brown painted eyes, lashes and brows. Coquette is set for a day of shopping in New York City, wearing a beautiful coral shantung skirt and jacket suit with black piping and gold buttons, shimmery hose, black velvet pumps, and a coordinating black velvet pill-box hat. She comes with a classic black handbag and of course, her array of shopping bags from Neiman Marcus, Bloomingdale's, and Bergdorf Goodman (this bag has some creasing). This is a VERY RARE SET and a Limited Edition of only 60. The set includes a Certificate of Authenticity/COA identifying it as a limited edition. The box has a few creases as if it had been squished a bit in shipping, but otherwise the doll and contents are in excellent condition.